Does it bother anyone that the breastplates on these guy are darker than their helmets. It just looks off. Tastymuffins wrote: Does it bother anyone that the breastplates on these guy are darker than their helmets. It just looks off. I'm guessing it's the difference between flat silver (the breastplates) and metallic silver (the helmets). It won't look as odd when paired with a visored helm, as the main helmet is flat sliver as well (with metallic visor), but I've never been a big fan of the grilled helms anyway. Having looked at all the sets from the various angles available now, I think the gatehouse ambush attack wotsit is catching my eye the most. 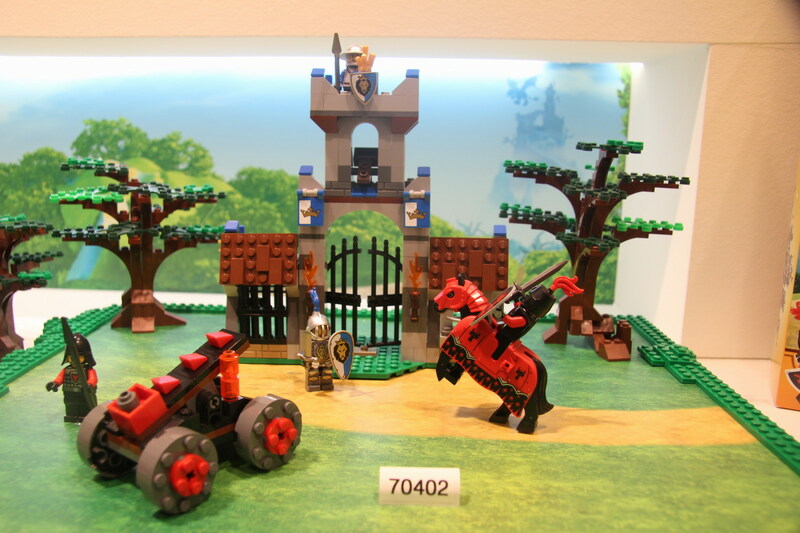 4 knights, a horse (with new barding and head armour) and a decent looking selection of bricks (rather than panels). That and the cart ambush are probably on my 'watch-list' ie if they get decently reduced on amazon or wherever. Overkill? That flick missile is tiny! Personally, I'm a bit pleased with this series. Not jump-up-and-down-holding-out-money excited, but moderately pleased. I think the main point here, which many have touched on, is that the improbable happened. We have a default Castle theme, alongside the LOTR. That, I think, is pretty cool. The more pictures I see of the upcoming sets the more I like them. Sure they might be a bit on the basic side, but they seem to do a good job of pitting the good knights against the bad knights. For kids I'm sure it'll feel iconic. The use of the lion and the crown is also growing on me. I actually am finding myself liking the lion more and more due to the fact that it has a more "serious" depiction instead of the silly smile from the Royal Knights and Knights Kingdom lion. I have a feeling I'll be picking up more of these sets than originally planned. The little cart ambush set looks promising. I'm always happy to have new face prints for my troops, so those will be a welcome addition as well. Get ready for reinforcements, Garhims! Also, I don't care for the new "Horse Helm" in gold, but the red one for the bad guys actually looks pretty decent. Sort of like it would go with the old red dragon ones. I suppose these sets may grow on me as time goes on. It was just a harsh contrast in detail level when compared to what I've gotten used to with the LOTR/Hobbit line, I guess. Has anyone seen photos from the licensed themes from the Nuremberg Toy Fair? They were on display at the London Toy Fair, but LEGO did not allow cameras - so we have the descriptions at the start of this thread. At Nuremberg they seem to have allowed cameras, but I don't see things like the Tolkien sets, Super Heroes, SW etc. Did they not display these at Nuremberg? Or did they allow people to photograph non-licensed themes only? Or did people just not post these? Or am I just missing them? Of these, it seems my second option is most likely. I always try to avoid weird color differences like that when I'm making minifigures, but it's actually kind of difficult. There are too many different colors that can be used for metal. Is the King's crown metallic gold instead of the usual color? And there are also some on Eurobricks. I have to admit confusion. I followed your links, but they seem to go to the same non-licensed theme sets we've been discussing in the last few pages of this thread. I'm asking where are the Tolkien sets? Also other licenses such as Super Heroes, Lone Ranger and Star Wars seem to be missing from all of these Nuremberg photos. Upcoming sets from each of these were on display at the London Toy Fair, and we got written descriptions on Brickset and FBTB, but none of these show up in Nuremberg, which seems odd, especially since they are promoting licensed themes with some large sculptures. I actually quite like the prospect of troops with black hands - I might swap them out, but I like giving black hands to certain troops (armoured knights, mostly), and I could use some more. I'd like some of the Lotr sets as well but... they're awfully expensive. Warg Attack was 70 euros, that's 10 more than Mill Village Raid and I think it has fewer figs and parts Shame too, because I like the look of that set. I agree on that it is a mix of the worst parts of castle 2000 but there are some good bits now that I have looked more on the sets, the first the price compering to LOTRs (ofcourse licenced, so more expensive) like the smallest set 4 figs, some castle accessories and a dog for 10 $ (probably gonna be 12,50 € in Finland) so that´s pretty good. And the minifigs look quite good, then the second biggest set, the baddies HQ is nice. Ok the parts in the so called "mountain" are not too great but better then in the Kings castle with its panels. I think i will get every set but not the Castle. So this topic has more become about the Castle 2013 but is there any more news on the LOTRs sets, over on EB there is alot of info about them, so maybe this two should be separated into to diffrent topics. Keep this as Castle 2013 and make an new Tolkien sets 2013 thread! These sets reminds me Knight Kingdoms I, also that season when the Lion Knights vs Bull Knights. Also they have a good looking. Still I don't understand why only a few horses in the whole series. I liked a lot when many different Knights were set (giving the impression of different personalities). I know that can be purchased many sets of the same and switch pieces to make them look diferent. Also, I remember that in the past many of the big sets included up to 12 minifigures. Of course, those castle sets were built with 375 up to 500 pcs. Doing a comparison with the Castle 2009 fantasy era, there are many aspects that dissapoints me at the moment of decide to buy these sets. As a parent I would say: "Ok, it's for my son... He will enjoy playing with these sets". The part I would be worried will be the quality of the pieces, that keep in a constant improvement, also the dye of the painted pieces. Practically Lego drives over Megablocks, but they must consider the relation [(pieces*fun)/price]. They've have done a good work when they need to get out of the economic crisis of the company and they can do it now. By the way, when some people said about the return of Lego Classic Castle Legends, I expected the re-release of the best sets ever made on the 35 years of Castle Sets. I have to admit to being quite underwhelmed by this line. After the Fantasy and Kingdoms lines, which showed just how good LEGO can do castle, this feels like a major regression. The sets look straight out of 2001. They look like Knights Kingdom 1.5--a cross between Knights Kingdom I and II. The structures honestly look like Knight's Kingdom II (this, for instance), though (thank goodness) the figures are far better. The excuse that these sets are targeted to a younger audience doesn't fly, as the age bracket is the same (7+) as on the terrific Kingdom's King's Castle. Sure, the new line is not absolutely atrocious, but it's decidedly uninspired. These castle sets generate for me a profound feeling of "meh." I will note that I love that we're getting the Sensei's beard in black, though.